"Now in its 12th year, the Ruth Easton New Play Series gives selected Core Writers 20 hours with collaborators to workshop their script—to write, rewrite, experiment, and shape their work. For playwrights, this means great leaps forward for their plays. For audiences, this means a thrilling and intimate night of theater." This was my third "thrilling and intimate night of theater" as part of the 2016-2017 series last night (see also December's Wink by Jen Silverman and January's queens by Martyna Majok), and it just keeps getting better and better! After first "discovering" PWC just last May when they kindly invited the Twin Cities Theater Bloggers to attend a reading and meet with playwright Lee Blessing, I have to admit I've become a little bit addicted. There's nothing quite like the rush of experiencing a new play for the first time. 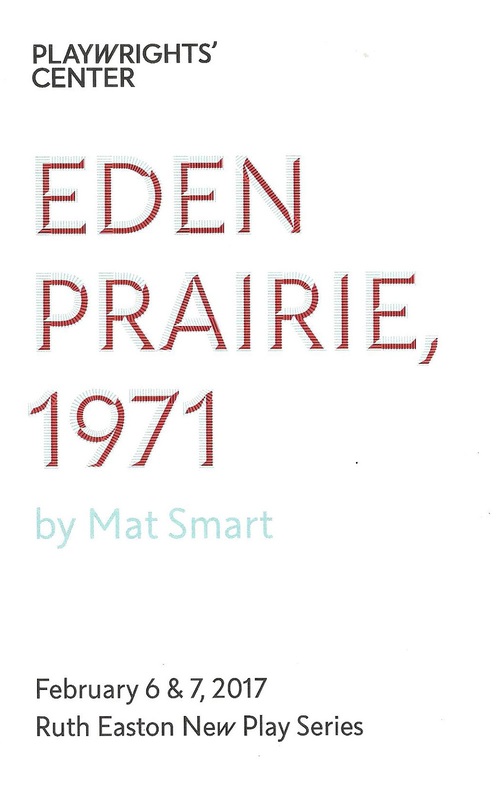 This month's new play receiving a workshop and two-night-only reading was Playwrights' Center Core Writer Mat Smart's very promising Eden Prairie 1971. 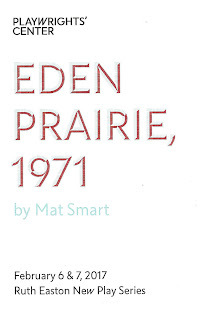 The description of Eden Prairie 1971 is: "On the night Apollo 15 lands on the moon, a draft dodger steals home to Eden Prairie, Minnesota from Canada. He risks arrest to deliver a message to a young woman from his high school class. This beautifully etched play challenges notions of our own bravery and the true cost of freedom." As always, PWC recruited some of the Twin Cities' best actors to workshop the work and perform it in two readings: Christina Baldwin, U of M/Guthrie BFA student Meredith Casey, and Billy Mullaney, with direction by Chicago's Henry Wishcamper and stage directions read by another U of M/Guthrie BFA student, Kendall Kent. The story plays out in one long scene, mostly between two characters - the aforementioned drafter dodger Pete and Rachel, his old friend from high school. Rachel's mother interrupts for a few hilarious and heart-breaking moments, but much of this play is of the two-people-sitting-in-a-room-talking variety, which might be my favorite kind of play. It really allows us to dig deep with the two characters, their relationship, and the topics they discuss, which is definitely the case with this play. Issues of relationships, friendships, responsibility, pacifism, and duty, all come into play. You might think, as I initially did, Vietnam was 40 years ago, what is there left to say about it? Judging by the intense and moving post-show discussion - a lot. My dad was drafted in 1967 and sent to Vietnam, but since he had just graduated from college with a degree in accounting, they put him to work accounting for troop movements and such, so he thankfully never saw combat. I've never asked him what it was like to receive that draft notice, how he felt, if he ever thought of trying to get out of it; I will now. The Vietnam War created much divisiveness in this country, the repercussions of which are still being felt. I hope to be able to revisit this play. There are some lovely (and disturbing) images described in the stage directions that I'm eager to see play out in a full production. And while the play would work anywhere in the country, the local references (Lunds! Harmon Killebrew!! Jim Kaat!!!) make Minnesota the perfect location for its world premiere. Simon is a lifeguard. Finn is terrified of water. Both are adrift, with broken hearts, returning to the tiny beach town of Jupiter and to families who need them. A play about love, karaoke, and the sea. I attended a reading of this play last year and am excited to see how it's changed since then. Also see the Events tab on the PWC website for more opportunities to see readings of new plays, most of which are FREE!